Let’s face it. Not everybody likes the current MyInfo shortcuts. Some people are used to other shortcuts for specific commands (like Shift+Ins for Paste) and others experience conflicts between MyInfo shortcuts and other application hotkeys. Because MyInfo has many commands and we have to assign almost each command a shortcut, some commands end up with really hard to use hotkey combinations. That will change with MyInfo 4, because you will be able to select your own hotkeys for your favorite commands. There was a big demand for that feature on our forums, so we have heard our customers! 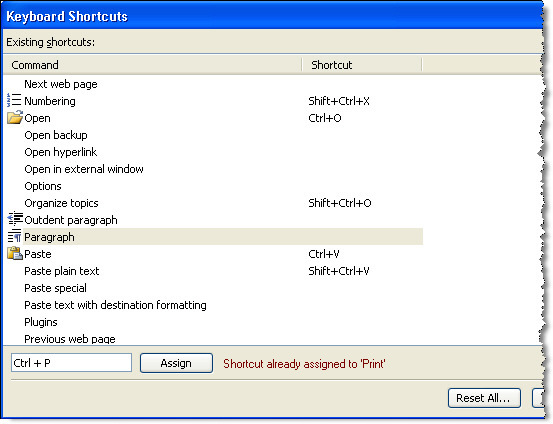 As you can see in the screenshot above, customize shortcuts feature will be intelligent enough to not let you assign the same hotkey to more than one command and if you do not like the customizations you have made to your keyboard shortcuts, you will always be able to reset them back to their default settings. MyInfo state icons is a nifty little feature that helps people organize their documents in the tree editor. MyInfo 3 includes a handful of predefined state icons like flags, task icons and emoticons. MyInfo 4 will include over 40 new state icons and we will add probably more after we hear your feedback during the best test. However, no matter how many new icons we add, there will be always some special cases that require unique icons, which are not available by default. That is why, in MyInfo 4 you will be able to add you own state icons! To make state icon use more productive, you will be able to customize the state icons context menu and even select keyboard shortcuts for these state icons. This will make assigning state icons to documents faster than ever before! If you think that MyInfo 3 misses some useful state icons, please tell us in the comments and we may add them in the new version. This was definitely one of your most requested new features for MyInfo. We have decided that MyInfo 4 is the right version for it. 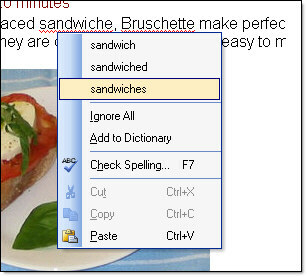 MyInfo 4 will offer you full-featured spell-checking! Along with traditional spell-checking, MyInfo 4 will spell-check as you type (of course, if you don’t want this, you will be able to turn it off in the options). As you see, you can words to the dictionary and what you could not see, is that the spell-checker learns from you. Each time you replace a misspelled word, the spell-checker takes a note and make better suggestions when you encounter a new misspelled word. MyInfo 4 will ship with English dictionary (all variations of it: International, English, U.S., and Canada). We will offer dictionaries for all popular languages on our web site free for you to download. We will continue with MyInfo 4 preview on Tuesday. As you maybe already know, we have started the development of MyInfo 4. This new release of MyInfo will offer many new features, but most importantly, we will improve the existing features according to your feedback in our forums. In the next days, we will begin revealing the new features in MyInfo 4. You can see an accurate preview of what’s planned for MyInfo 4 on the MyInfo 4 Roadmap in our forums. Initially, only the current customers of MyInfo 3.x will be allowed to beta test the new version. We will post details about MyInfo 4 beta test next week. Tomorrow, we will post an article for the first new feature in MyInfo 4! We are pleased to announce that MyInfo 3.60 is now available! This is primary a bug fixes release. If you already own MyInfo 3.x, the upgrade to version 3.60 is free – you should receive download instructions on your email.